As I've mentioned before, I spent 10 days at a cottage earlier this month. I had an amazing vacation, and a lot of my time was spent outdoors. The weather was great, and the sun was shining, so a sunscreen was a must-have. I turned to Institut Esthederm Sun Care Lotion *** ($90 CAD)* to help protect my skin. "Esthederm’s Sun Care Lotion *** protects against UV rays and sun aggressions and activates the natural pigmentation process for a strengthened tan. This lotion is perfect to use for protection under a tropical sun or for prolonged sun exposure. Institut Esthederm Paris celebrates its 35th year in the beauty industry with innovation and distinction. The brand is available in more than 400 skin clinics and day spas in the Quebec province and in Canada, as well as in La Maison Ogilvy, located in downtown Montreal." - Protects against UV rays and sun aggressions. - Activates the natural pigmentation process for a strengthened tan. Biologically protects skin cells, in addition to filters and screens, to prevent photo-aging, the risks of skin redness, and cancer. - Optimizes the vital functions and the energetic activity of skin cells. The result? - Skin that protects itself while tanning, and adapts itself faster to the sun. This formula smells like a typical sunscreen, which is one of my all time favourite scents! The scent lingers very lightly on my skin, and it isn't overwhelming. This lotion is a medium thickness, and it rubs into my skin fairly quickly. Institut Esthederm does recommend to apply this lotion 20 minutes before sun exposure, and to reapply every 2 hours. I do wish that this formula was waterproof, as that would make it that much more beach-friendly. This formula is SPF 20, which is lower than what I'm used to using. However, I used this bottle all week long, and I love the results! I spent a lot of time on my vacation going on walks, swimming, reading by the beach, playing volleyball, etc. I make sure to always apply a sunscreen to my entire body before doing anything outdoors. 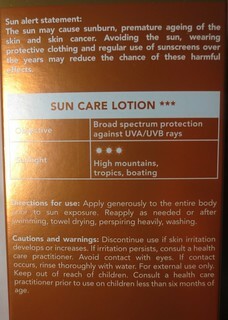 I found with this formula from Institut Esthederm to protect my skin from burning but I was still left with a great tan! This formula also was hydrating and my skin was always left feeling soft, even after a few hours in the sun. I also love that this formula wasn't too thick, as I hate heavy sunscreens that don't sink in quickly.